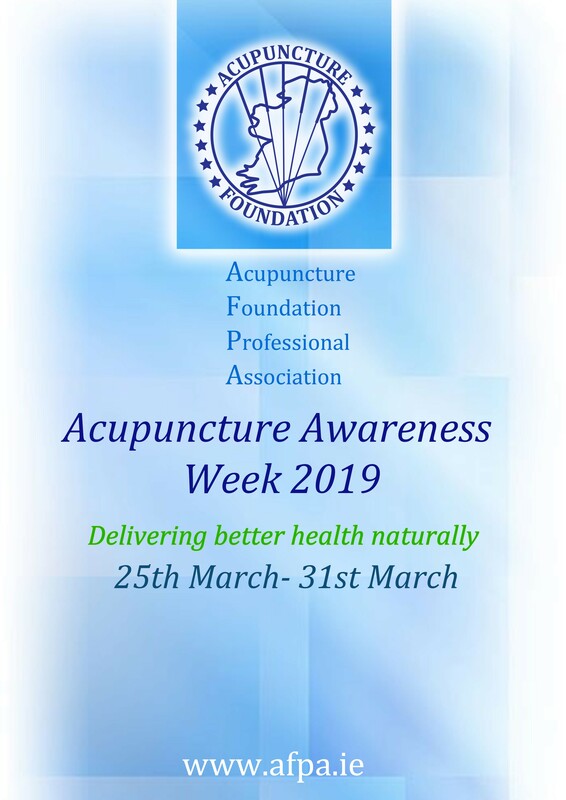 For the 7 th year running, the AFPA is organising the Acupuncture Awareness Week in Ireland – March 25th-31st. This is an excellent opportunity for AFPA members to highlight the benefits of traditional acupuncture. Acupuncture has been used within Chinese medicine for thousands of years. Modern methods have allowed us to establish that it is safe, effective, evidence-based and cost-effective (MacPherson et al., 2001; Zhang et al., 2010; Mcdonald & Janz, 2017). For these reasons it is well placed to play a significant role in solving the current opioid crisis (Fan et al., 2017) and filling gaps in conventional medicine. Research has shown that acupuncture is safe in the hands of well-trained practitioners (MacPherson et al., 2001). However it is important to note that not all acupuncturists have the same training and some have none at all. AFPA members are professionally regulated and have a minimum of 3 years (3,600 hours) specialist training in acupuncture which is the highest level of acupuncture training in Ireland. The most up to date research definitively shows that acupuncture performs better than “sham” acupuncture and the effectiveness of acupuncture can no longer be claimed to be due to the placebo effect (Lundeberg et al., 2011; Mcdonald & Janz, 2017). The evidence for the efficacy and effectiveness of acupuncture is demonstrated in The Acupuncture Evidence Project, published in January 2017, which provides the most up to date comprehensive review of evidence regarding acupuncture (Mcdonald & Janz, 2017). There are over 8,000 acupuncture clinical trials published and the efficacy of acupuncture in 117 conditions has been confirmed from studies using the highest levels of rigorous scientific methods i.e. systematic reviews and meta-analyses thus confirming the place of acupuncture as an evidence-based therapy. Musculoskeletal issues, depression, chronic pain and IBS are gaps in conventional care identifird by UK GPs and acupuncture has been shown to be more effective than usual care for these conditions (Thomas et al., 2006; Macpherson et al., 2012; MacPherson et al., 2013; Macpherson et al., 2013; Mcdonald & Janz, 2017). As the evidence for acupuncture has increased so too have the number of international clinical guidelines recommending acupuncture. 2189 positive recommendations were found for the use of acupuncture. Of these, 1486 were related to 107 pain and 703 were related to 97 non-pain indications (Birch et al., 2018). The American College of Physicians 2017 clinical guidelines strongly recommend acupuncture as first line treatment over pharmacologic treatment for acute, subacute and chronic low back pain (Qaseem et al., 2017). Acupuncture treatments in Ireland are reimbursed by private health insurers if the treatment is given by a member of the AFPA. Since Chinese medicine is a complete system of medicine, acupuncture is used for a wide range of conditions and not all of these have been researched as yet. The World Health Organisation (WHO, 2003) provides a categorised list of conditions for which acupuncture has been researched (see below). More recently (Mcdonald & Janz, 2017) found the highest levels of evidence for positive effect of acupuncture relating to 8 conditions: Migraine prophylaxis; Headache; Low Back Pain; Knee Osteoarthritis Pain; Allergic Rhinitis; Chemotherapy-induced Nausea & Vomiting; Post-Operative Nausea & Vomiting; and Post-Operative Pain. A further 38 conditions were found where acupuncture treatments have evidence of potential positive effect. Birch, S., Lee, M.S., Alraek, T. & Kim, T.-H. (2018) Overview of Treatment Guidelines and Clinical Practical Guidelines That Recommend the Use of Acupuncture: A Bibliometric Analysis. The Journal of Alternative and Complementary Medicine, 24 (8), pp.752–769. Qaseem, A., Wilt, T.J., McLean, R.M. & Forciea, M.A. (2017) Noninvasive Treatments for Acute, Subacute, and Chronic Low Back Pain: A Clinical Practice Guideline From the American College of Physicians. Annals of Internal Medicine, 166 (7), p.514.